footballers. View the eBay listing here. FIFTY-year-old bottle-tops featuring local footballers are the latest New Norfolk-related pieces of memorabilia to turn up on eBay. 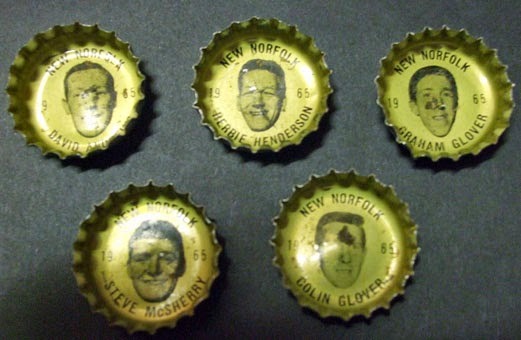 A South Australian seller has listed five Coca-Cola bottle-tops dated 1965 and bearing the names and faces of New Norfolk footballers David Andrews, Herbie Henderson, Graham Glover, Steve McSherry and Colin Glover. He has set a starting bid of $20. The bottle-tops were produced by Coca-Cola Bottlers (Hobart) Pty Ltd and formed part of a series featuring the players of all TFL teams of the day - Clarence, Glenorchy, Hobart, New Norfolk, North Hobart and Sandy Bay. A collector on another website suggests the following New Norfolk players featured on the 1965 series, which followed a similar Coca-Cola promotion the year before: David Andrews, Les Barrett, Alan Beiser, Les Bradley, Barry Browning, Roger Browning, Geoff Burgess, Glen Burrill, Ron Cornish, Tassy Davidson, Colin Glover, Graham Glover, Herb Henderson, Geoff Hill, John Hudson, Peter Hudson, Trevor Leo, Tony Marsh, Graeme McArthur, Steve McSherry, George Menzies, Leon O'Donnell, Paul Plunkett, Garth Smith and Boy Wilton.